Trail runners have replaced traditional boots as the preferred footwear for an Appalachian Trail thru-hike. I chose La Sportiva Wildcats for our 2,200 mile journey and this is my La Sportiva Wildcat review. For trail runners Wildcats are a bit on the heavy side but compared to boots they are light. Accumulative fatigue is a serious concern when you are hiking 8-10 hours a day, every day over the course of 6-months. It is estimated an average thru-hiker takes over 5 million steps during their journey. Having one or two fewer pounds to lift up and down will have a noticeable effect. The Appalachian Trail is a wet trail. On a thru-hike it is probable you will experience multiple instances of multi-day rain. Wet gear is uncomfortable and causes chafing and blisters. La Sportiva Wildcats, after becoming drenched, dry quicker than their boot counterparts. Even non-leather boots. Before hiking the AT I tried this out by crossing a river in them to get to a waterfall. The shoes were saturated but by the end of the day they had dried completely. The same cannot be said of Merrill Moabs that I had also used before the AT. I once got caught in the rain in them and it took two full days for them to dry. One note, if you end up going the boot route, do not get waterproof boots. No boot is truly waterproof on a thru-hike and once soaked the waterproof barrier will not let the moisture escape. You might not believe this, but I only used three pair of La Sportiva Wildcats over 2,200 miles. 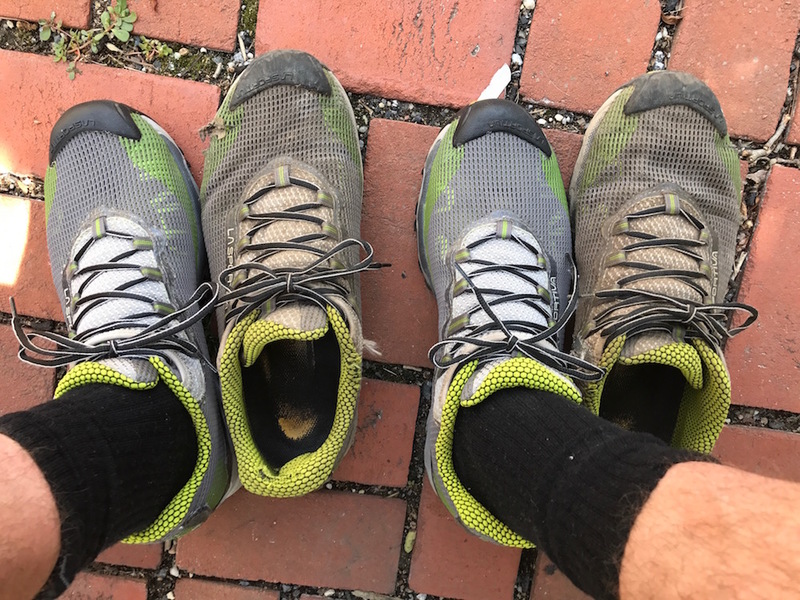 The first pair lasted 1,100 miles and the middle pair could have lasted longer but they had been battered by the Pennsylvania rocks and I wanted fresh treads before entering the White Mountains in New Hampshire. I was expecting to replace the shoe every 500 miles and was completely blown away at the Wildcat’s durability. I met hikers in leather boots that only lasted 300 miles into the trip. Because of the design of the shoe and liberal use of flexible mesh the Wildcats need minimal break-in. Traditional boots need many miles before they fit perfectly. The flexibility of the shoe and lack of break-in time also contributed to me not getting a single blister over the course of 6-months of hiking. Not one blister! Selling for around $100 the Wildcat is an affordable shoe. I actual got one pair of the three on sale for $75 and free shipping. Compared to boots this is a deal. 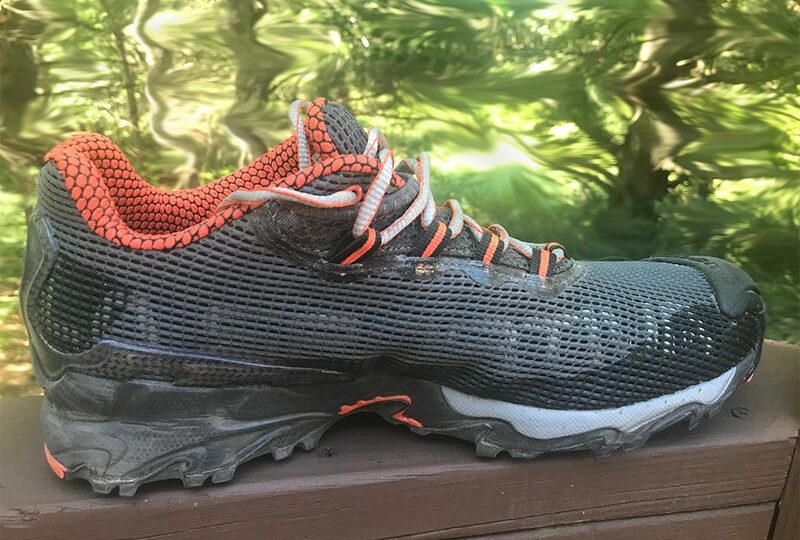 And it’s about on par for other trail runners as well, although some run up to $150; this is still nowhere near the expense of an Asolo or comparable boot. Find the best price for Wildcat shoes on Amazon. One of the greatest design features of the Wildcat is the rubber toegaurd. Where other shoes’ rubber lip stops at the top of the toe the Wildcat’s goes up and over. This is crucial because you will be kicking rocks and roots all day and the other shoe design will cause the rubber to disengage from the shoe causing it to flap. Chica’s toe lip compared to mine. It’s amazing other shoe companies haven’t caught on to this. I remember one hostel where everyone’s shoes were lined up on the front porch. Every single pair, save mine, had flappy rubber on the toe. True story. Now that I sold you on the shoe what are some of the problems with them? First off, if you have bigger feet you are out of luck. Really, anything bigger than a 13 is a no go. The European sizing goes up to 47.5 which is supposed to translate to 13.5 American, but the shoe runs small. I typically wear 12.5 – 13 size shoes and the 47.5 fits me perfectly. Next, not all feet are the same and not everyone will have the love affair I seem to have with these shoes. In fact, one of our YouTube subscribers sent me his pair because they didn’t fit him right and he couldn’t return them. When I bought my first pair, we went to REI and I really thought I was going to walk out the door with a pair of Salomon’s. But after trying on the pair of Salomon then the La Sportiva there was no comparison. The Wildcats were like a fairy tale, they felt just right. Finally, the mesh can break especially after hundred of miles in wet conditions. The one’s I used for 1,100 miles were starting to fall apart, but what can you expect? Trail runners are not a great solution for those that need ankle support or for those carrying mega-weight packs. Otherwise, I think there are compelling reasons to wear trail runners on a thru-hike. La Sportive Wildcats are my choice.